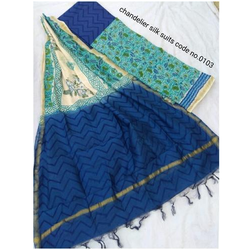 We are one of the leading manufacturer and supplier of Chanderi Silk Suits.We obligated to meet the quality standards as per the customer demand. 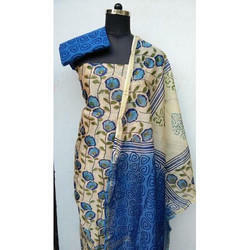 Hand Block Printed Chanderi Suits With the aid of modern tools and sophisticated technology, we have been able to bring forth the clients a remarkable collection of Chanderi Suits. 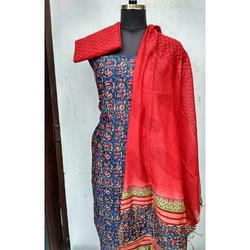 We are making a graceful self printed red suit is enriched with bright block print all over. 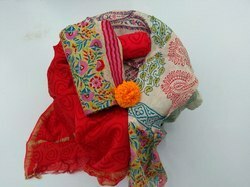 It is complimented with red color bottom and red and black dupatta. To give a rich look. 100 % guaranteed color or fabric. We are prepared from high grade quality material in chanderi suits and is duly tested on various quality parameter by our experts.